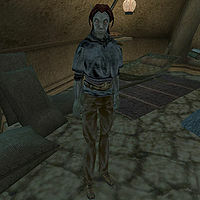 Sedam Omalen is a Dunmer trader who can be found at the Outpost in Ald Velothi. He has a wide selection of goods for sale. Aside from his natural resistance to fire and the sanctuary provided by his ancestors, Sedam knows the following spells: Detect Key, Detect Animal, Mark, Recall, and Divine Intervention. This page was last modified on 12 April 2015, at 15:15.